Great location. Close to market and playground. 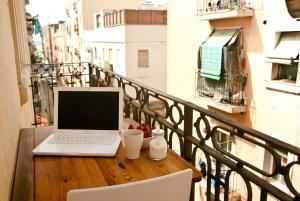 Walking distance to Gothic Quarter and El Born. Clean and comfortable. Good communication prior to arrival. We loved staying at these apartments. The apartment they offer on booking is on the first floor, which is great because its easy to get in and out quick. The roof deck is up 6 or 7 flights of (narrow) stairs. It was perfect for our family. The location was perfect. It was a few minutes walk to the beach. You can see the water from the balcony. We also loved that the apartment was clean and comfortable. Perfect for my family of 3. Lots of supermarkets in the area, close by. Also, transportation was easy to walk to. Communication with Albiol was great and he provided us with useful information. Super clean and spacious apartment on the first floor and well equipped. The furniture is quite new and in excellent conditions. The apartment is really close to the beach. It was cold in Barcelona during our stay. The air-condition worked very well and kept the room warm and comfortable. We loved the apartment very much and would book it again. We loved it because of the location and the balkony. We travel with my grand daughter (5 yrs old). She is not a very good at eating food not cooked in house. Amenities in the apartment, easy access to grocery/fruit stores help us to keep her well nourish. Location - proximity to the beach & centre. Modern & fresh decor. Super Lage, nicht zu laut, sehr netter Verwalter, der sehr gut deutsch spricht, alles ist zu Fuß gut erreichbar - 50 Meter nur zum Strand, Supermarkt,Bäcker, Apotheke, Bars und Restaurants nur wenige Minuten entfernt, Altstadt zu Fuß in ein paar Minuten .... Es war ein wunderschöner Aufenthalt, ich werde dort bald wieder buchen. Lock in a great price for Barceloneta Apartments Beach – rated 9.2 by recent guests! One of our best sellers in Barcelona! Providing a terrace, Barceloneta Apartments Beach is located in Barcelona, not far from Santa Maria del Mar and Port Olympic. Free WiFi is featured. All units are equipped with a flat-screen TV and a fully equipped kitchen with a a toaster and coffee machine. There's a fully equipped private bathroom with shower and a hair dryer. Picasso Museum is 1.1 miles from the apartment, while Barcelona Cathedral is 1.3 miles away. 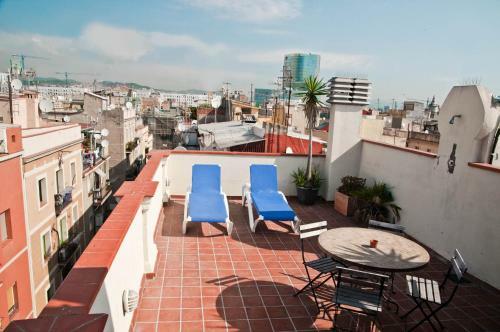 Barcelona-El Prat Airport is 11 miles from the property. 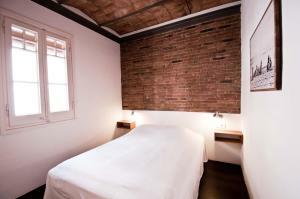 Ciutat Vella is a great choice for travelers interested in food, culture and sightseeing. 뀐 Located in the top-rated area in Barcelona, this property has an excellent location score of 9.6! 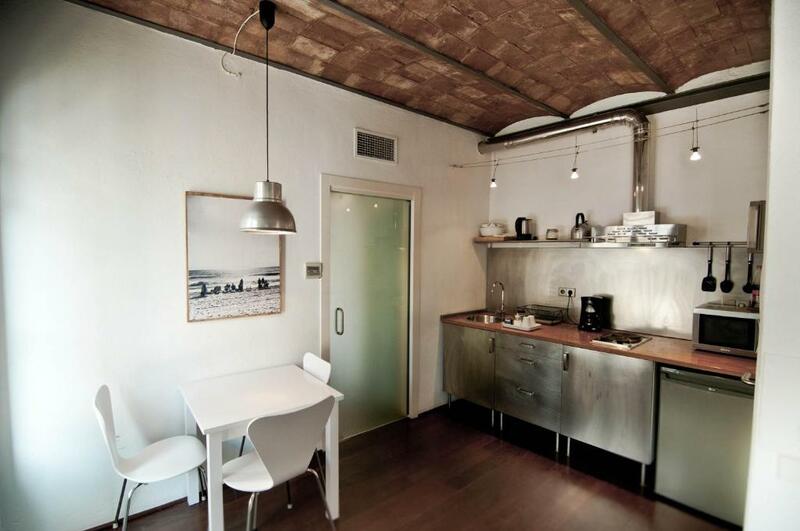 When would you like to stay at Barceloneta Apartments Beach? This apartment has a stovetop, toaster and air conditioning. Barceloneta Apartments Beach are located 250m from the beach in the former fisherman quarter of Barceloneta. The apartments are totally renovated and preserve the charm and style of the quarts de casa (quarterhouses) which are architectural heritage of Barcelona. 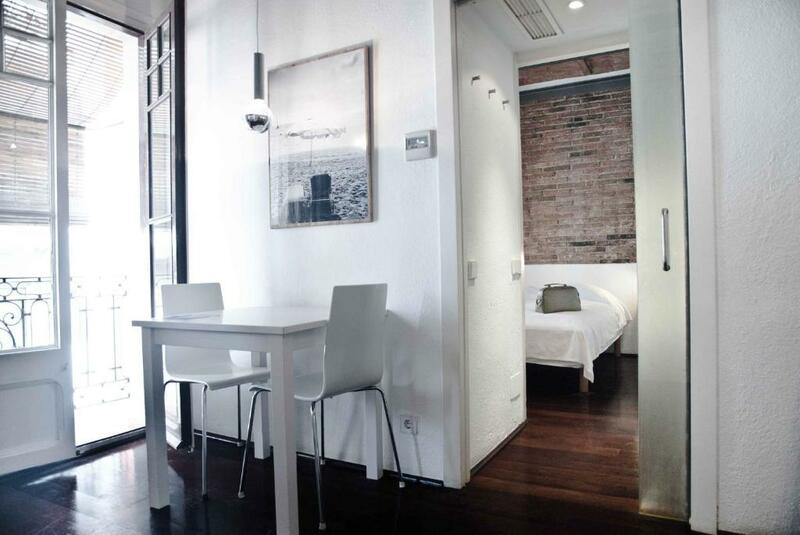 The quarts de casa are apartments of 30 sqm in the geometrical area of Barceloneta All apartments are modern and equipped with everything you need for your vacations or business stay. The apartments with balcony contain a separate bedroom with a comfortable double-bed, a stylish bathroom, complete kitchen with facilities to prepare your own meals or cold drinks, lounge with a table for 3 people, double sofa-bed, TV with satellite, air condition and free wireless internet access. They have a private balcony with view of the sea. Elevator is not available and the stairs are very narrow, which is typical for the area. The groundfloor loft apartment is situated at street level. There is a double bed on a mezzanine and a sifa-bed. There is no private balcony. The common rooftop-terrace offers incredible panoramic views of the city and sea and is reserved exclusively to our guests. We are a small local company who own Barceloneta Apartments Market and Barceloneta Apartments Beach. 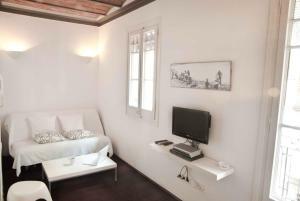 The apartments are totally renovated with enthusiasm and preserve the charm and style of the quarts de casa. 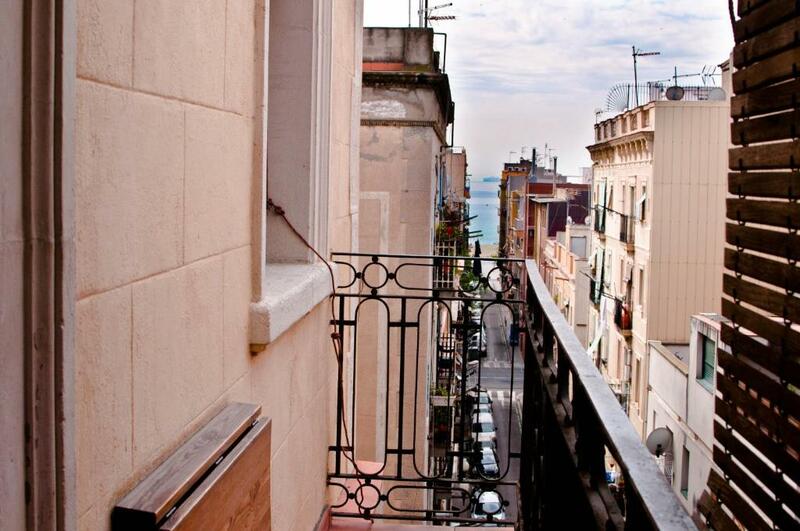 We like to welcome you in Barceloneta and invite you to experience the life in this very authentic quarter of Barcelona. La Barceloneta (little Barcelona)is a former fishermen quarter dating back to 1753 full of exciting restaurants and bars. With its 5 kilometres of mediterranean beaches it certainly is the area that people from Barcelona come to for relaxing. The Olympic Port built in 1992 for the Olympic Games and next to the Barceloneta, houses the Arts Hotel, Casino and the splendid giant whale made of bronze by Gehry. On the beach of Barceloneta there is the sculpture LEstel Ferit (wounded star) by Rebecca Horn and has become one of its iconic landmarks. At the other end of the famous boardwalk of Barceloneta is located the W Hotel with its shape of a huge sail, designed by R. Bofill. Barceloneta Apartments Beach are totally renovated and preserve the charm and style of the quarts de casa (quarterhouses) which are architectural heritage of Barcelona. The quarts de casa -buildings originally designed to house one family per floor and were later divided into smaller apartments of 30 sqm. 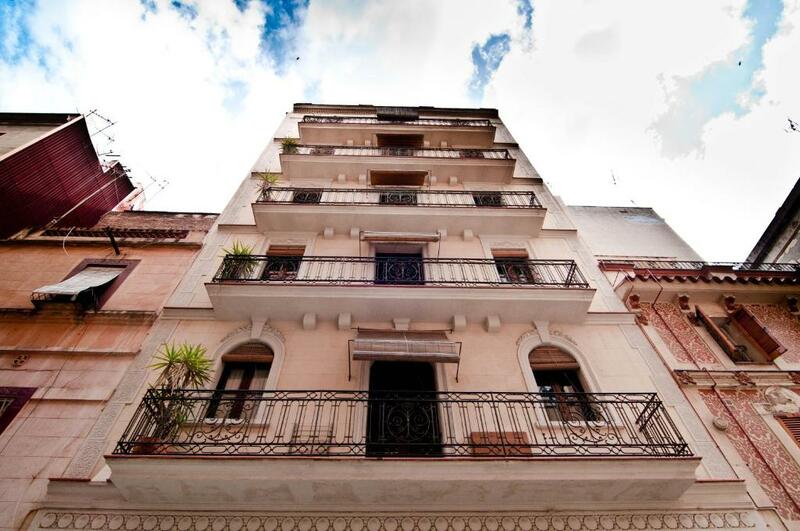 Today the majority of the 5631 apartments in the Barceloneta are quarts de casa. 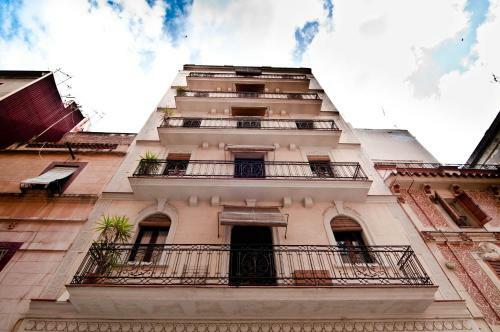 Area Info – This neighborhood is a great choice for travelers interested in food, culture and sightseeing – Check location Excellent location – show map Guests loved walking around the neighborhood! House Rules Barceloneta Apartments Beach takes special requests – add in the next step! A EUR150 damage deposit is required on arrival (around USD167.16). This deposit will be fully refunded at check-out, as long as there isn't any damage to the property. Barceloneta Apartments Beach accepts these cards and reserves the right to temporarily hold an amount prior to arrival. Please inform Barceloneta Apartments Beach of your expected arrival time in advance. You can use the Special Requests box when booking, or contact the property directly using the contact details in your confirmation. A damage deposit of EUR 150 is required on arrival. That's about 167.16USD. This will be collected by credit card. You should be reimbursed on check-out. Your deposit will be refunded in full by credit card, subject to an inspection of the property. Amazing staff with incredible approach to guests! Access to the apartment is via code only and there was no key handed over. Access is easy but personally it feels a little unsafe if you are not at home. Ground level = noise at night. Some nights there was noise in the street outside. The trash trucks were a bit noisy at night, but that was only for about 20-30 min. Unfortunately it was usually right when were going to bed.